Hokkaido’s powder snow is the cream of the crop when it comes to Japan’s plethora of winter sports destinations, but if time or funds don’t permit a trip to the nation’s northernmost island this season, there is skiing right here on Kansai’s doorstep. While perhaps not quite on a par with the powder-laden landscapes of Nagano, Tohoku, and Hokkaido, Kansai does have a snowy side. From mid-December through to mid-March, some of the more rural and mountainous pockets of the region experience significant snowfall. One thing’s for sure, if it’s snowing in the city, you can be sure there are amazing skiing and snowboarding conditions in the surrounding alpine areas. 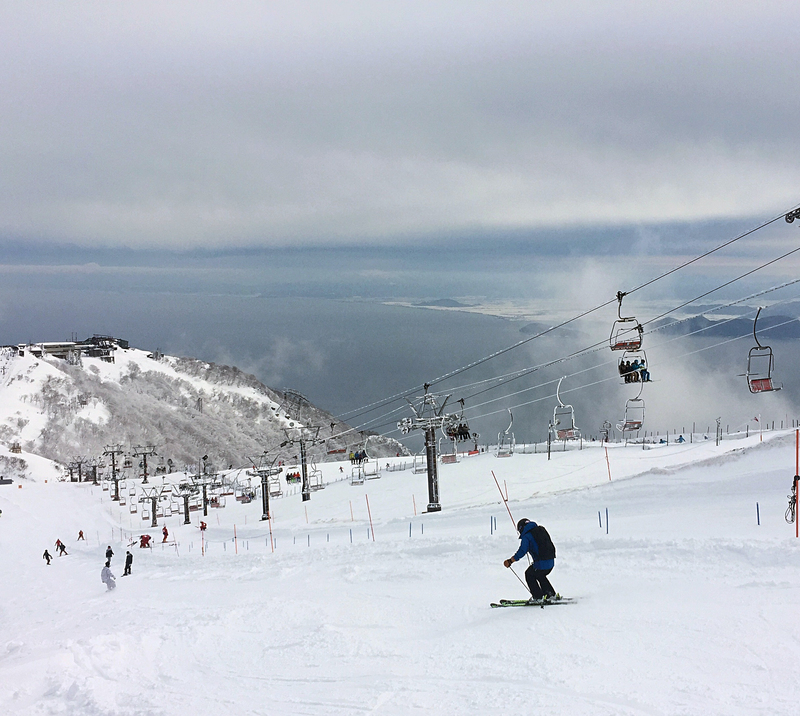 From Kyoto, the closest and most accessible skiing option is a rather small resort called Biwako Valley in Shiga Prefecture. On clear, sunny days, skiers are treated with views of the vast Lake Biwa which lays at the base of the mountain range. There is a good mix of beginner-friendly runs as well as some technical terrain featuring moguls and a park with ramps and rails. There are a few forest runs that offer tree-lined trails and limited tree skiing for those brave enough to carve into it. There is also a ski school attached to the resort and it is easy to call ahead and book classes. The adult daily lift ticket costs approximately ¥5,500. Depending on weather conditions, the resort is expected to open mid-December. You can access the resort via JR train from Kyoto Station. Get off at Shiga Station and take a short shuttle bus to the base of the ski resort. After renting your gear, a large ropeway takes you up the mountain to the slopes. Cutting fresh tracks amongst the trees at Biwako Valley. Hyogo Prefecture boasts some excellent skiing and snowboarding options. The resorts commonly known as “Kannabe” in Toyooka are mostly dated but are the best option in the prefecture. Hotels, houses, and restaurants surrounding the slopes appear to hail from the glory days of Japanese skiing during the bubble economy of the late 1980s. Oku Kannabe, Manba, and Up Kannabe are the three main resorts in the Kannabe highlands. They offer joint lift tickets, so you can ski different resorts with a single day pass, providing lots of variety in runs. Kannabe hosts a range of winter sporting activities including snowshoeing, sledding, snowcat rides, and hot-air balloon rides. Oku Kannabe also has floodlights and offers night skiing. The best aspect of Kannabe is the limited crowds and wide-open slopes. Daily lift passes for adults in Kannabe cost around ¥4,500. Snowboarding the groomed trails at the top of Manba in Hyogo. Another superb element of Japanese ski culture is the widely available onsen (hot springs) that are usually close to ski locations. Kannabe offers convenient access to Kinosaki Onsen, regarded as one of the best hot-spring centers in Japan (read all about it on page 28). The onsen town is about a 40-minute drive from the ski resorts at Kannabe. The Kinosaki tourism board recommends traveling in a private vehicle because of the rural nature of the area. Public transportation options are available but are rather limited. Also in northern Hyogo Prefecture is Hachi Kita Kogen in Kami city and [Hachi Kogen] in Yabu city, both located on opposite sides of Mt. Hachibuse. The resort pair offers a joint lift ticket which provides an excellent day’s skiing. These two ski resorts hail from the 1960s and adult lift tickets are about ¥4,500. Gifu, although not officially considered a part of Kansai, but close enough to easily access from Kyoto, also offers some top winter sports destinations. Takasu Snow Park located in central Gifu boasts a stellar half pipe that is claimed to be the best in Japan, but the only way to verify is to head out to the mountain and try your luck. Takasu also offers joint lift tickets with Dynaland, and the two combined afford approximately 43 kilometers of courses. Last year, they added a few tree runs to their trail map making this resort a true gem. Train access to Takasu Snow Park is limited, and it is also recommended that you arrive with your own vehicle or join a bus tour. Takasu adult daily lift tickets are around ¥5,000. Takasu Snow Park is also located close to Shirakawa-go, a charming farm village most picturesque during the winter with snow caking the roofs of its distinctive A-framed houses. If you are going to ski at Takasu, plan an extra day in your itinerary to take in the surrounding towns. Takayama is another worthwhile town to check out and trying the beef sushi while there is a must. A little further afield in Fukui Prefecture, Ski Jam—officially known as Ski Japan Katsuyama—is another popular snowy destination for Kansai dwellers. It is especially popular with younger skiers and snowboarders and seems to be most enjoyed by those in their teens and 20s. One-day adult lift tickets are ¥4,700. Snowboarders waiting to tackle the terrain in Shiga. Another convenient aspect of Japanese ski culture is that at many resorts you can rent all essential gear. Of course, skis, boots, poles, snowboards, helmets, and common rental items are available, but many resorts also offer rentals for ski pants, jackets, gloves, and other warm alpine wear. Call ahead to make sure that your desired equipment and sizes are available. Ski and snowboard boots are usually available up to 30cm. Snow Japan is a valuable resource when planning your Japanese winter sports adventures, featuring reviews, snow conditions, costs, and lots of up-to-date information on all aspects of snow holidays in Japan.